For over 20 years the Miami String Quartet has been one of America’s top-rank chamber ensembles. Highlights of recent seasons include performances at Lincoln Center’s Alice Tully Hall, 92nd Street Y, and the Kennedy Center, as well as engagements in Philadelphia, Boston, Indianapolis, Los Angeles, New Orleans, San Francisco, Seattle, and St. Paul. International highlights include appearances in Bern, Cologne, Amsterdam, Istanbul, Lausanne, Montreal, Rio de Janeiro, Hong Kong, Taipei, and Paris. The Quartet has served as resident ensemble at the Kent/Blossom Music Festival and has appeared at Chamber Music Northwest, Mostly Mozart, Ravinia, Brevard Festival, Rutgers Summerfest, Music from Angel Fire, Virginia Arts Festival, and the festivals of La Jolla, Santa Fe, and Pensacola. 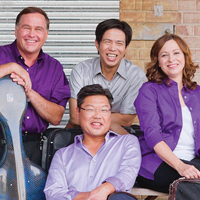 Formed in 1988, the Quartet has also won recognition as laureates of the 1993 Evian Competition, 1992 Concert Artists Guild Competition, 1991 London String Quartet Competition, and as the 1989 Grand Prize winner of the Fischoff Chamber Music Competition. Winners of the 2000 Cleveland Quartet Award and Chamber Music Society Two ensemble of the Chamber Music Society of Lincoln Center from 1999-2001, the Miami String Quartet has been in residence at Hugh A. Glauser School of Music at Kent State University since 2004. The Miami String Quartet has commissioned and premiered works from Bruce Adolphe to Ellen Taaffe Zwilich, as well as Ricky Ian Gordon, Annie Gosfield, Philip Maneval, Roberto Sierra, Robert Starer, Augusta Read Thomas, Joan Tower, and Peteris Vasks. They have recorded the music of Fauré, Saint-Saëns, Ginastera, and Vasks. Their next recording project will be devoted to the music of Joan Tower.